Forest or field. Public or private. High country or cypress-ringed swamp. Land is where conservation starts. Every acre matters, which is why North Carolina Wildlife’s land stewardship projects are so diverse and far-reaching – from landscape-scale planning for large public holdings to backyard habitat improvements for homeowners. Your stewardship efforts assist wildlife and habitat conservation so future generations may enjoy wildlife and wild places in North Carolina. Habitat loss is one of the leading causes of species decline today. All habitats, regardless of size, are essential to the survival of native wildlife. We can all take small steps in our daily lives to make a positive impact on our local environment. By providing food, water, cover and places to raise young, you can help to restore and enhance wildlife habitat in your community. Songbirds, butterflies, dragonflies and game species such as deer, quail and turkey will make their home on your property, or find refuge there during migration. Depending on where you live and what your objectives are, by gardening for wildlife, you can help make a difference. Our Garden for Wildlife programs are making a positive difference in North Carolina. Learn about the programs and join our efforts. Wise planting reduces home energy costs. Improves water quality, filters pollutants, curbs water usage and minimizes water bills. Planting native wildflowers and shrubs reduces area to mow while attracting wildlife. Serves as an area to enjoy nature and observe wildlife. Creating a wildlife habitat may increase your property value. Food: Native plants provide wildlife with nectar, seeds and berries. Feeders can supplement. Water: All animals need water to survive and some need water for bathing or breeding. Cover: Wildlife needs shelter to escape bad weather and predators. Places to Raise Young: Wildlife needs special habitats for bearing and raising young. 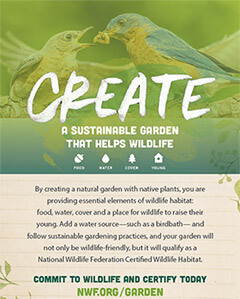 If you have provided food, water, cover and places to raise young for wildlife, your yard can be certified by the National Wildlife Federation and North Carolina Wildlife Federation as a Certified Wildlife Habitat. Apply online or print and mail your application today to show your commitment to wildlife.